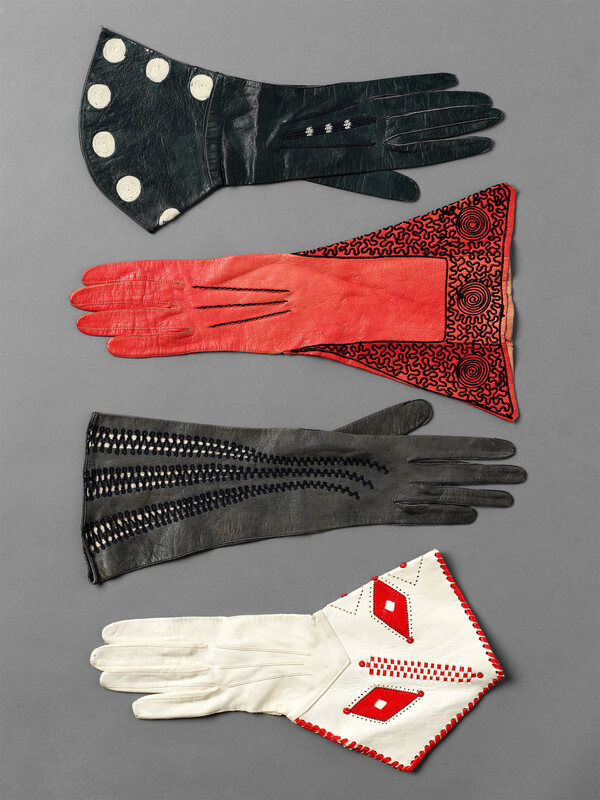 The fashion for gauntlet gloves, their extended flared wrists fitting neatly over the slim sleeves of coats, jackets and dresses, provided glove makers with ample opportunity for imaginative decoration in the later 1920s and the 1930s. These four examples, all but one part of a pair, show a preference for distinct, non-naturalistic motifs. The top pair, of green leather is embroidered with large cream tamboured spots, and the coral coloured pair is couched with black cord in a spiral and vermicelli design; both are stamped inside ‘Penberthy, Court Glover, Oxford Street’. The firm of Frederick Penberthy, whose shop was situated slightly to the east of Selfridges, was a long established and award winning supplier of gloves, hosiery and fans. Below them, the single sage green leather glove has an openwork design of looped black cord that emphasises its length, and is stamped ‘Gant Jay Grenoble’. The glove making industry of Grenoble, in south-eastern France, had its roots in the Middle Ages, and was at its height in the 18th and 19th Centuries when was a major employer in the area. It was here that medical student, Xavier Jouvin, devised influential methods of glove sizing and cutting patented in the 1830s, based on his study of the hands of local hospital patients. 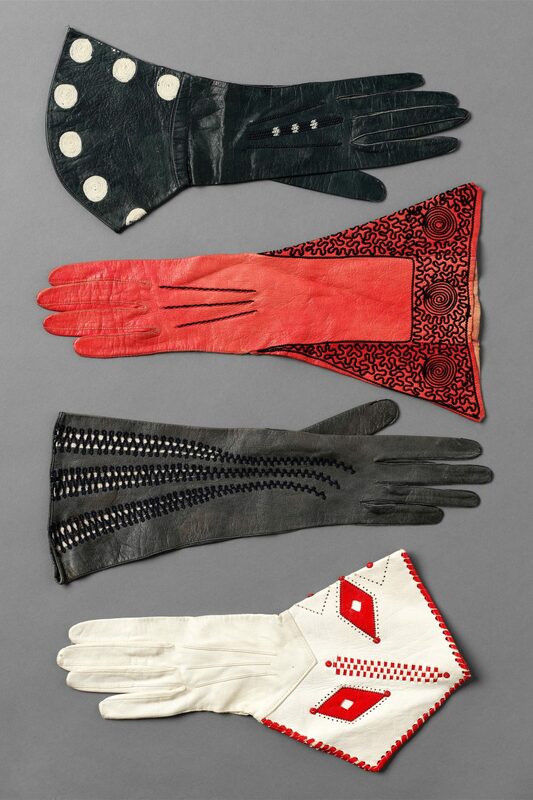 The cream leather pair at the bottom of the image is appliquéd with scarlet leather diamonds bordered with punched holes. The edges are oversewn with strips of scarlet leather which are also woven through a central band. The gloves have no maker’s identification.